Sometimes I do interviews on the Shirt List and I would like to send a link to the interviewees before it goes live but there was no clean way of doing this before. 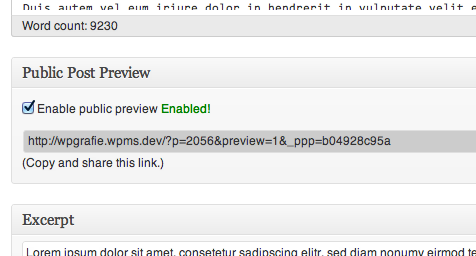 Now, with this new plugin you can create previews for unpublished WordPress posts. Have you ever been writing a post with the help of someone who does not have access to your blog and needed to give them the ability to preview it before publishing? This plugin takes care of that by generating a URL with an expiring nonce that can be given out for public preview. All you have to do is install the plugin, enable Public Preview on the post and share the link. And there you have previews for unpublished WordPress posts.